List of 38 news stories. One Marian High School senior has achieved National Merit Finalist standing in the 2019 National Merit Scholarship Program. 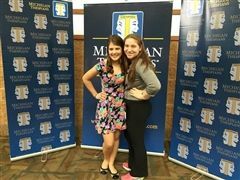 Daughter of Kim Toma Giessler and Paul Giessler of West Bloomfield, Jacqueline Giessler is one of 15,000 finalists and represents less than one percent of U.S. high school seniors. Five Marian High School seniors recently signed national letters of intent to play their sports in college next year. Neve Badalow will play soccer for Michigan Tech; Jansen Eichenlaub will play soccer for the University of Virginia, Katie Sullivan will play soccer for Western Michigan, Mallory Lynch will play volleyball for U of M-Dearborn and Claire Stechow will play tennis for Wittenberg University. Marian Rice Players is proud to begin their 2018-19 season by bringing you their modern interpretation of one of Shakespeare’s most well known plays, A Midsummer Night’s Dream. Marian High School is hosting a College Night, Wednesday, March 7, 2018, from 6-7:30 PM in the Marian gymnasium. This event is MACRAO-sponsored (Michigan Association of Collegiate Registrars and Admissions Officers), and all area high school students and parents are welcome to attend. Marian celebrated Catholic Schools Week this winter in a variety of ways. Prayers of thanksgiving for the gift of Catholic education began each day, as students, families, teachers and administrators, alumnae, and benefactors were specially remembered. Five Marian High School seniors signed national letters of intent to play their sports in college. Three will play soccer: Claudia Schilling at Western Michigan University, Julia Surratt at Trine University, and Zoe Hudson at Bowling Green University. In addition, Gabby Granata will swim at Williams College, and Julia Heacock will play field hockey for State University of New York at Oswego. 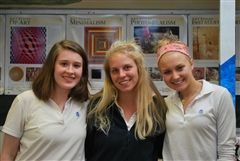 Christian outreach, a hallmark of Marian education, takes place all year long at the high school. Much of the outreach is student-initiated and coordinated by Project Care, a student organization. Marian High School announced that Seniors Hope Chase, Katerina Kornievskaia, and Margaret Perr’tiangha have been named commended students in the 2018 National Merit Scholarship Program. A Letter of Commendation from the school and National Merit Scholarship Corporation (NMSC), which conducts the program, was presented by Stacey Cushman, academic dean, to these scholastically talented seniors. Marian High School recognized the volunteer contribution of Jim Noteman and John Woch, two former Board members, at the National Philanthropy Day Dinner sponsored by the Greater Detroit Chapter of the Association of Fundraising Professionals (AFP). Noteman and Woch were honored for their service to the school by serving as volunteers long after their terms on the Marian Board of Directors ended. Marian High School Congratulates the Class of 2017! Diplomas were bestowed on 142 seniors at Marian High School’s 55th annual commencement exercises at St. Hugo of the Hills Church, Bloomfield Hills. Valedictorians of the Marian Class of 2017 are Katherine Gordon (Farmington Hills), Elli Johnson (Huntington Woods), and Eliana Margherio (Bloomfield Hills). Barbara Spreitzer-Berent, Class of 1970, was selected as Marian High School’s 2017 Distinguished Alumna for her professional accomplishments, her spirit of generosity in her volunteerism, and her commitment to her high school. As Distinguished Alumna, Barbara addressed the Class of 2017 at its commencement ceremony at St. Hugo of the Hills Church. Marian senior Shannon Atwell recently signed to play volleyball next fall at John Carroll University, where she plans to study biology. 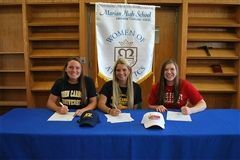 Four Marian senior athletes made college commitments when they recently signed national letters of intent. Rebekah Irwin signed to swim at Washington and Lee University, while Maria Kaschalk, Hannah Redoute, and Elaina Eckert agreed to play soccer at three different colleges. Maria signed with Troy University; Hannah signed with Western Michigan University, and Elaina signed with Marquette University. Marian Senior Danielle Videtich’s original artwork took first place at the Student Art Town show sponsored by the Birmingham Community House. Her monochromatic self-portrait took the show’s top award, earning her an art set. During Marian High School’s 16th annual Celebration of Thanks, Keith and Mary Beth Rich MacGuidwin of Bloomfield Village were recognized for their many years of service and dedication to the school. Marian’s Spanish Honor Society (SHS) recently visited Detroit’s Neinas Elementary School for what has become an annual visit. Neinas Elementary is a preK-5th grade, public, dual language learning academy in southwest Detroit. More than half of the students who attend Neinas are bilingual, while some speak only Spanish. Bloomfield Hills – Three Marian High School seniors recently signed national letters of intent to play their sports in college. Colleen Grombala signed with John Carroll University to play lacrosse; Lauren Ogurek will also attend John Carroll University to play softball, and Maria Hickey will be playing basketball at Lake Forest College.